Time spent on wrangling ecommerce is time stolen from ﬁ nessing the UX. What could the answer possibly be? Moltin is an ecommerce web service API. Gateways You don’t get total isolation from gateway weirdness. You can’t just swap one gateway for another. Still needs planning for payment ﬂ ows to call the right Moltin API methods at the right times. Moltin bills on API requests. Advantages You get almost complete control over the UX. You don’t need to build all the boring stu ﬀ . Multiple apps (website, mobile, PoS, etc) can all use the same backend with no extra work. Swap out your front end easily. Start adding inventory via Forge before site is built. Disadvantages Creates a very large dependancy compared to something self-hosted. That comes with risk of downtime or service discontinuation. Introduces network latency into many operations. Not as ﬂ exible as something completely bespoke. 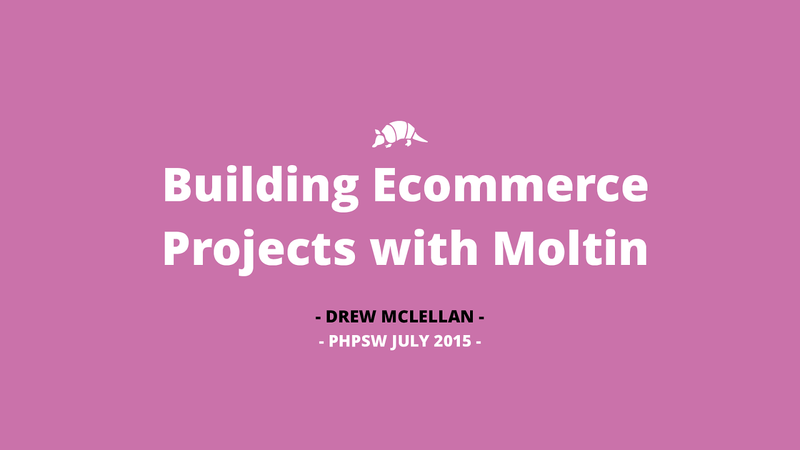 View Building Ecommerce Projects with Moltin on Notist. Moltin is an ecommerce API for building online stores without needing to implement carts, inventory management and payment gateway integrations yourself. In this talk, find out how to use the Moltin PHP SDK on your next ecommerce project, where its strengths and weaknesses lie, and why you might consider building on top of an API rather than building something custom. For technical reasons, Perch Shop doesn't use Moltin anymore.